Over the years, we've gotten a lot of questions about how to cook perfect barbecue, with one of the most asked about meats being the beef tri-tip. This pleasingly shaped piece of meat is packed with flavor, but many aren't sure how to tackle it given its propensity to turn out tough when cooked poorly. When's the best time to apply a dry rub? How hot should the smoker be? How long should it rest? How should it be cut? Taking these questions into account, we've got a recipe that'll address all of them and more while teaching you how to make a delicious beef tri-tip using your smoker. This tri-tip roast will become one of your favorite things to cook. Let's get started. If this is your first time, just follow the steps of the cooking process​. 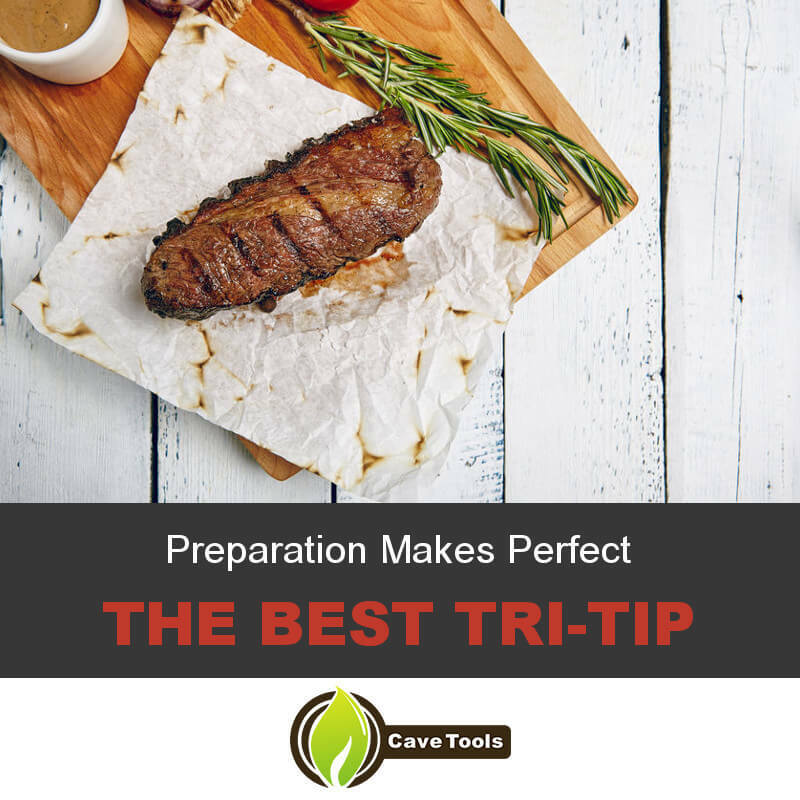 In order to smoke a delicious beef tri-tip steak, you'll need to collect a few ingredients and supplies first. Thankfully, there's nothing here that's all that hard to get your hands on. Beef tri-tip (5 lbs, trimmed). Oak wood chunks or chips. 6 cups water (more or less as needed). 1/2 cup plus 1 tablespoon kosher salt. 1/2 cup dark brown sugar. When you've collected all your supplies, you'll be ready to take on the recipe. Forewarning: It will take multiple days to complete this dish, so don't try to cook it an hour before the cookout is supposed to start. The first step to a delicious tri-tip is a good brine. Brining helps to retain moisture during a long smoke and can add a delicious flavor all its own. To make a simple but effective brine, mix together about six cups of cold water with half a cup each of kosher salt and dark brown sugar (firmly packed), plus a tablespoon of all the spices listed above. Stir well until everything is incorporated and dissolved into the liquid. Place in your meat, adding more water to cover as necessary. Toss in several ice cubes to help lower the temperature, then cover the container and store it in a cool place overnight or up to a full day. If you need to, add more ice cubes to keep the temperature of your brine consistent. When your beef has brined for the desired amount of time, remove it from the water and discard the brining liquid. Thoroughly pat dry with paper towels. Once dried, mix up your dry rub using the salt and spices. Thoroughly coat your meat with the rub on all sides, making sure to massage it into every crevice of the tri-tip to maximize the flavor. When you've achieved maximum coverage and used up all your spices, place a wire rack inside a baking tray and lay your meat on top of it. Store it in the fridge overnight to allow the surface of the skin to dry out. After the meat has had a chance to "dry age" in the fridge, take it out half an hour prior to when you expect to cook (if you're using wood chips instead of chunks, now would be a good time to start soaking them in hot water). Pat the surface of the meat dry if necessary, then allow it to warm up to room temperature for a more even cook. If spots of the dry rub have fallen off or were blotted away, mix up a small batch of the spice rub and reapply as necessary. While your meat is warming up, take the opportunity to light your smoker. Pile up the charcoal and get things hot, then close the lid to get things hot. The target temperature to shoot for is around 250 degrees to 275 degrees Fahrenheit, so adjust the airflow until you're around that are. About ten minutes before you're ready to cook, fill your water tank and add your wood, letting the smoke and steam build up right before you toss on your tri-tip. When your smoker is at optimal temperature and smokiness, ​place tri-tip on the grates. Close the lid to trap as much heat in the smoker as possible. As you cook, monitor your coals, wood, and water levels, adding more as needed and adjusting the air vents to keep the temperature as consistent as possible. Every hour or so, flip your tri-tip to help it cook more evenly. If the outside appears to be getting too done or threatens to burn at any point, wrap or tent the meat loosely in aluminum foil to help protect it from the direct heat. and continue smoking meat in indirect heat. You can also take the opportunity to start checking the temperature around the three hour mark. You're aiming for something around 130 degrees Fahrenheit at the thickest point. Once you've hit the right internal temperature, take your tri-tip off the heat and move it to a plate to rest. Wrap tri-tip in foil and allow it to rest for at least ten minutes if not half an hour (the longer the better when it comes to resting). This ensures the meat has a chance to finish cooking and reabsorb some of its juices. During this time, you'll likely see it climb to around 145 degrees internally for a perfect medium rare. After your meat has rested, there's nothing stopping you from digging in. To ensure maximum tenderness, always cut your tri-tip across the grain in thin slices. The best thing about this cut of meat is that its shape and size allow for it to have virtually every level of doneness at once, from rare and medium rare all the way to well done at the thinnest tip. Pick your favorite (and serve the well done bits to the kids) and serve it up alongside some roasted vegetables and macaroni and cheese for a great barbecue dinner. And there you have it. With this recipe, you should be able to smoke a beef tri-tip like a pro in no time, avoiding some of the common pitfalls newcomers make to this sumptuous cut of ​beef. Get your friends and family together for a barbecue and show them what you've got when it comes to meat smoking. Did you like this recipe? 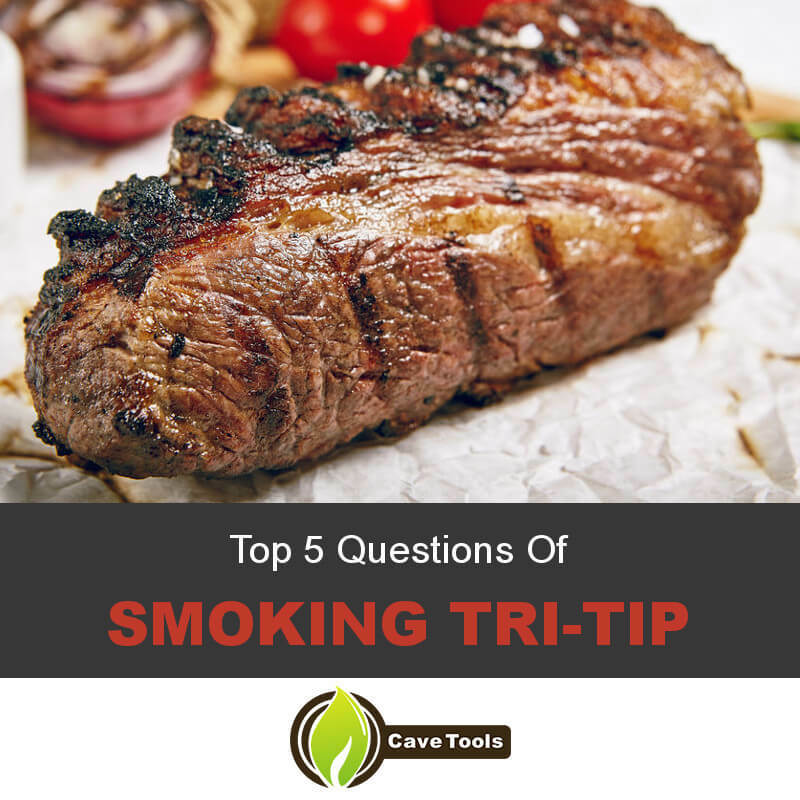 Any other questions you might have about smoking tri-tip beef? What about some tips of your own? Leave a comment down below and remember to share this article with a friend, especially one who might need some help. What Temperature is Tri Tip Done? A tri tip is best cooked to medium temperature or below. To achieve a rare roast, cook the tri tip to 120 degrees F. For medium-rare, pull the roast at 130 degrees F and finish it at 140 degrees F for a medium roast. The roast will continue to rise 5 degrees as it rests. How Long Does it Take to Smoke a Tri Tip on a Traeger? When cooking a tri tip on the Traeger using the Smoke setting, it should take about 4 to 6 hours to fully smoke. The total time isn't too bad for such an amazing cut of meat. It’s best to use a probe thermometer to know the exact time to pull the roast because the cook time can depend on the size and weight. What Do You Put on a Tri Tip Sandwich? 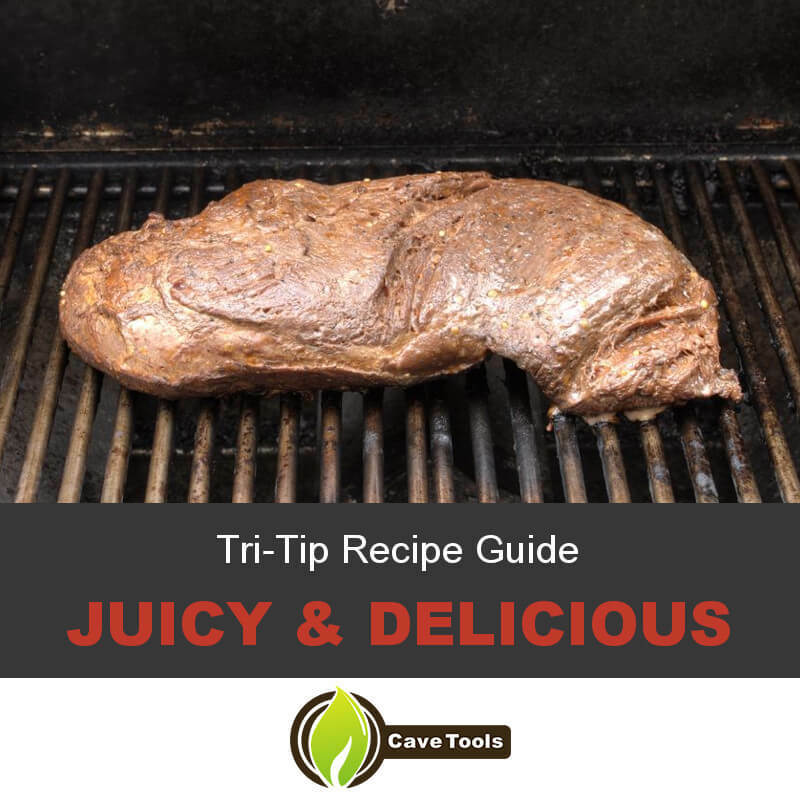 Tri tip is an excellent cut to use for making beef sandwiches. We suggest buttering your buns and building a sandwich with cheddar cheese, barbecue sauce, sliced onions, and sliced tomatoes. The sandwiches really taste the best if you thinly slice your cooked tri tip, being careful to slice against the grain for the most tender slices. Why Do You Need to Slice Tri Tip Against the Grain? In beef, there is something called the grain. This is the way that the muscle fibers run, either horizontally or vertically. When you slice a tougher cut of meat like tri tip, we always suggest that you slice it “against the grain.” This means to make horizontal slices if the grain is vertical, and vice versa. This will ensure that your teeth don’t have to do so much work when you’re eating the meat. What Temperature Do You Smoke Tri Tip? We like smoking tri tip between 250 and 275 degrees F. This temperature will infuse the perfect amount of smoke into the meat and cook it at a low-and-slow rate. Since tri tip can be tough, this slow cooking temperature is perfect for ensuring juicy and tender meat.